Fair glowing and flawless skin is a secretive desire of everyone. Beauty conscious people spend a lot of money on commercial beauty products but often don't get the desired results. However, if you have been tired of spending and wasting money on commercially prepared chemical products then try to go with natural skin whitening fruits and their juices. Essential Vitamins and minerals present in these fruits not only improve skin complexion but also helps to fight against skin damaging free radicals and prevent from skin blemish and age spots. In addition, skin whitening fruit juices help to maintain the natural skin moisture and create a natural glow on your face. 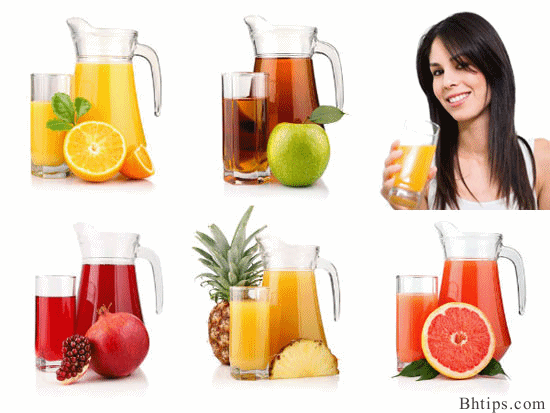 Here we have a collection of best natural fruit juices which really help a lot to get fair glowing and flawless skin. In this article you will learn how these fruit juices help to get fair glowing and flawless skin. 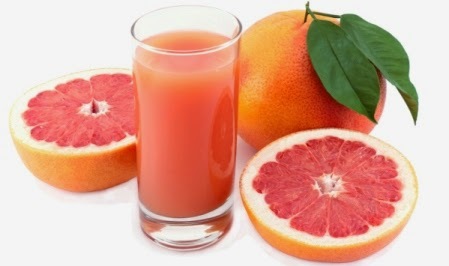 When we talk about natural fruit juices for fair glowing and flawless skin, Orange juice comes at the top of the list. Oranges are rich in anti oxidants which not only fight against skin damaging free radicals but also helps in giving you clear and even tone complexion. As we know melanin pigment give us dark complexion but Orange contain a good amount of Vitamin C which penetrates deep into the skin where the melanin producing cells are located and inhibit their production. 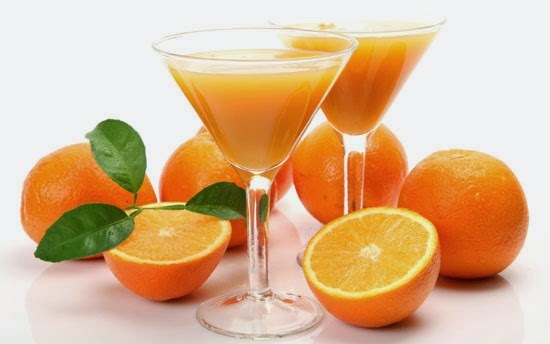 Orange also helps to flush out toxins from body and hence give you clear, flawless and glowing skin. Try to consume one glass of orange juice on daily basis and see the magic of this juice after few days. Lemons are also rich in vitamin C and thus, lemon juice acts as a good cleanser for your skin. Lemon are very helpful in balancing the pH level of your skin which helps in giving you glowing skin. Vitamin also improve skin elasticity and slow down aging process. 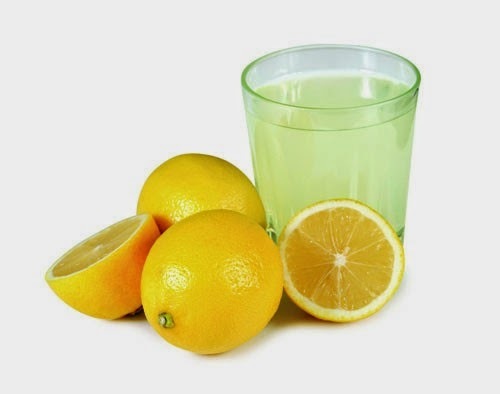 To make lemon juice take one glass of water, mix juice of one lemon and add 1 teaspoon of honey. A mixture of Lemon and honey helps a lot to get fair glowing and flawless skin. Grapefruit juice is rich Vitamin A and C and also contain a good amount of anti-oxidants that fight against skin damaging free radicals. The vitamin C and the antioxidant effects protect the skin from environmental hazards. Grapefruit also stimulates the production of skin collagen that brings smoothness and elasticity to the skin and slow down aging process. The retinol antioxidant gives your skin softness and, renews damaged skin and naturally cures skin pigmentation. The potassium present in the grapefruit helps to smooth wrinkles and age spots and provides a protective shield against harmful UV Sun rays. Grape fruit not only refreshes the skin but also brings a natural glow. Apple not only helps in keeping you healthy, but it also helps in providing you flawless and glowing skin. 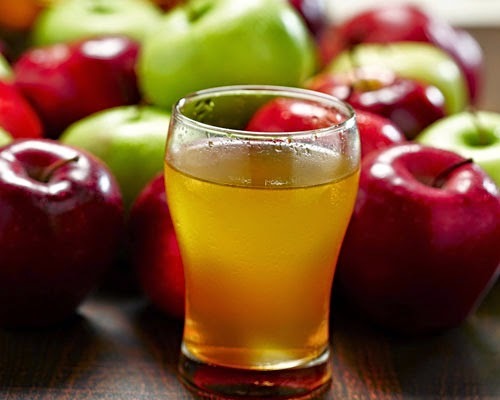 Apple juice contains antioxidants that prevent your skin from pre-mature aging and wrinkles. It also helps in preventing damage of the tissue and also promotes the growth of new healthy cells. The minerals such as iron, magnesium, zinc, phosphorus, copper and chlorine present in apple brings a natural glow to your skin. 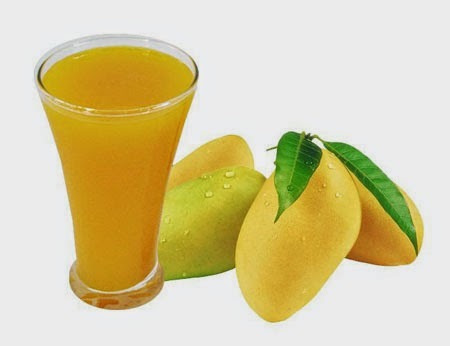 Mango juice is rich in antioxidants that not fight against skin damaging free radicals but also helps in cell rejuvenation and cell repair.It helps detoxify skin from inside and also prevents occurrence of acne. Vitamin C present in Mango juice not only keep your skin healthy and glowing but also brings natural fairness to your skin by reducing melanin production. Mangoes juice has the ability to reduce dark spots, blemishes and acne, thus brings a natural glow to your skin. Vitamin A and Beta carotene in this fruit restore, rejuvenate and revive your skin with vigor as well as add natural shine to your skin. The antioxidants present in mango juice slow down the process of skin ageing and age spots. They also protect your skin against the harmful free radicals which can cause skin cancer. Regular consumption of 1 glass mango juice provides you fair and smooth skin. Pomegranate is also very helpful for lightening the skin tone. Drinking a glass of pomegranate juice daily gives you a fair glowing and flawless skin tone. Besides this pomegranate juice also help to slow down the process of ageing by reducing wrinkles and fine lines caused by constant exposure to sun. Pomegranate juice also helps promotes the regeneration of the skin cells and prevents hyper pigmentation and occurrence of dark spots. 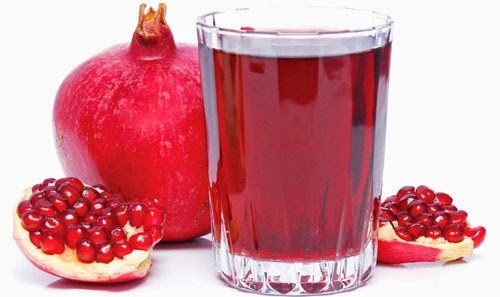 Pomegranate juice helps in the regeneration of cells in the epidermal and dermal layers of the skin and enhances the process of healing of wounds. Pomegranate juice is full of Vitamins A, C and E which are great for keeping your skin soft, supple and glowing. It also contains Zinc as well, so for people who suffer from acne, its great for treating and preventing acne as well. Papaya juice is very helpful in lightening the skin, helps to remove dark circles around the eye and healed the wounds on the skin. 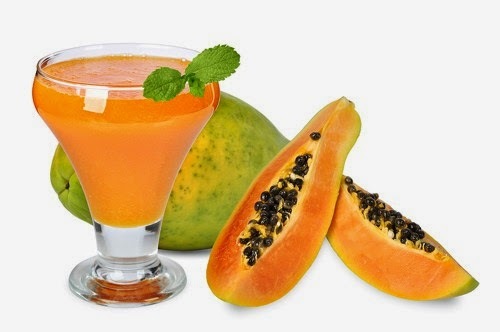 Papaya juice improves the digestion and remove toxic elements from the body. Papaya juice is also very helpful in curing the skin tans and brightening the complexion. Vitamin C present in papaya plays an essential role in the development of collagen, a protein your body uses to create new skin cells. Vitamin C is also a type of antioxidant that fight against free radical damage that can age your skin. Papaya juice not only cures skin wrinkles but also delays aging process. Regular consumption of papaya juice also provides shine to the skin, which comes from within and purely natural and long lasting. Papaya helps the skin by reducing the aging signs on the face. Note: Pregnant woman shouldn't drink papaya juice without consulting a gynecologist as it can cause miscarriage or premature birth. Pineapple juice not only cleanse and soften skin but also works wonderfully to rejuvenate dull and dry skin and brings natural glow to your skin. 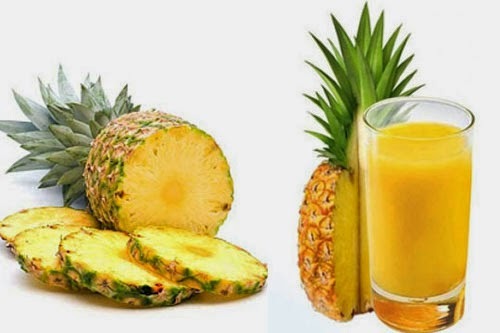 Pineapple Juice is also very helpful in treatment of acne and acne marks. Thus, pineapple juice for skin is one of the perfect remedies to make skin clear. As pineapple juice is full of Vitamin C and potassium, it is one of the best sources of anti-oxidants that not only improve your immunity but also help to keep your skin and body feel and look younger. Vitamin C also protects your cells from damage caused by environmental toxins, such as cigarette smoke. Pineapple juice is rich in Alpha-Hydroxy Acids which slows down the aging process. Pineapple juice is good for acne treatment and heal wounds quickly. Pineapple juice is very helpful for synthesis of collagen, which is require for providing the necessary elasticity to the skin and keeps your skin firm. Skin wrinkles are caused by the lack of collagen. So drink pineapple juice on a regular basis to stay looking young and beautiful. 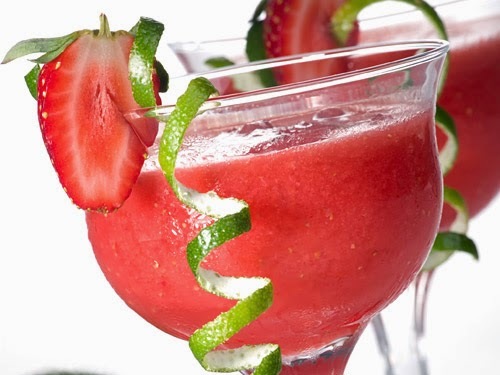 Strawberry juice is rich in skin lightening properties and also cures blemishes and acne marks effectively. It also reduces sun damage and minimizes the effects of ultraviolet rays on the skin.Vitamin C in strawberry boosts collagen production keeps your skin young and healthy. Besides giving you fair glowing and blemish free skin, It delays the process of ageing and keeps wrinkles at bay. 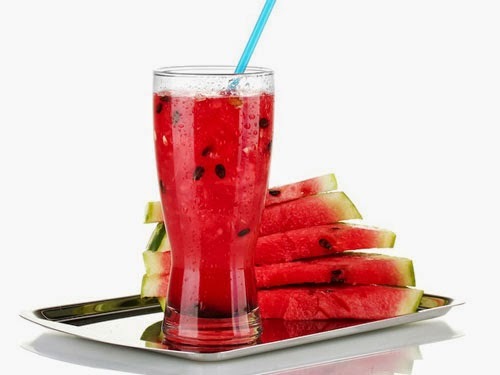 Watermelon juice is a perfect drink to get fair glowing and flawless skin during summer season. It is very good for the skin and removes excess oil from the skin which cures many skin problems like acne and pimples. Watermelon is a natural moisturizer and toner for the face and makes the skin more whiter, smoother and glowing in summer season. Due to 93% water contents and combination of Vitamins A, B6, C, Watermelon not only flush out toxins from body but also keeps your skin well hydrated, recover damaged skin cells and slow down aging process by enhancing skin elasticity.